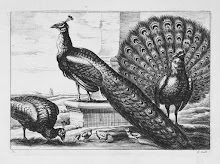 The Baroque period was named for a misshapen, flawed pearl. Portuguese navigators found the pearls in 1510 in the East Indian town of Broakti that they called Baroquia. The imperfect pearls became known as Pérola barroca. Jewelers were inspired by the unusual pearls to create fantastic pendants. 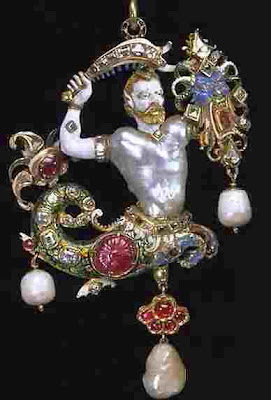 The Canning Jewell which is probably Italian in origin, features a merman with a large pearl designating his torso. It is embellished with solid gold, diamonds, rubies, pearls and enamel work. 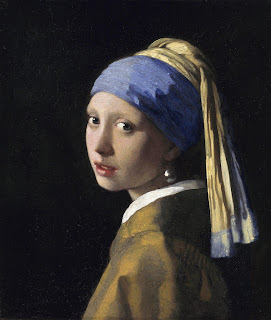 Other depictions of pearls were more direct as in the exotic Girl with the Pearl Earring, by Johannes Vermeer (1632 -1675). His Dutch Baroque Masterpiece shows pearls as a status symbol of the seventeen century. 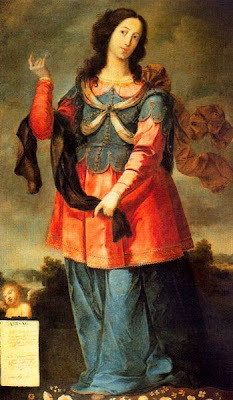 Josefa de Óbidos (1630–1684) the Portuguese painter did not require jewelry for her saints figure. Her Baroque works were devoted to religious themes with their own imperfections.